In Only 15 Minutes Per Day! Achieve Maximum Fitness Results in Just 15 Minutes Per Day! Complete & Balanced Personal Fitness Plan To Provide You With Maximum Results in Minimum Fitness Time. Burn Fat For Good. 95% of everyone that goes on a diet gains all their weight back and sometimes gets even fatter. Now you can learn how to be in the successful 5% group that keeps the weight off forever. Lose Weight Without Trashing Your Metabolism. Are you tired of hitting the wall in your diet plan? You probably started consuming your own muscle and slowed your metabolic rate down to a snail's pace. Let me teach you to crank your metabolism into overdrive to make your body a FAT BURNING machine. Build Muscle. As you are BURNING FAT FAST, you will learn how to change and create a body that has definition, strength and tone. Get Maximum Results. You will learn the exact fitness training and meal planning secrets to eat healthy, tone up and get in shape for the rest of your life. Enjoy a healthier, happier, longer life in a body that is fit, trim, and in better shape than you could ever imagine! Today's bookstores are crammed with diet and fitness plans. TV is full of shows about how to eat better and look better. But none of them provide a full and comprehensive plan to transform your life. None of them show you how every piece of your life fits together like a puzzle to ensure that you are living the healthiest life possible. Now you can build the muscle tone you've always wanted, burn off the extra fat that's weighed you down, lose the weight that's held you back, and enjoy a personal fitness and health plan for life. My name is Robert Adams and I'm a nationally certified personal fitness trainer, weight loss coach and fitness and health enthusiast. Everyday my clients ask me to help them shape their bodies into powerful, beautiful works of art. They claim to have tried the crash diets and the fad workouts and have been disappointed to discover that nothing has worked. I know the reason. It's because there's a lack of personal balance. You cannot improve your eating and expect your body to shed pounds by the end of the week. You cannot work out and expect your body to become toned overnight. Personal balance is about a holistic change in everything you do. Let "Flab to Fab" Transform Your Life! "Flab to Fab" is not a diet book. It's not a workout book. It's a life-transforming book meant to help you restore balance. There are some diet choices that you will need to make. There are some workout programs that you will need to integrate into your life. But a personal health and fitness plan is so much more. I've devoted my life to discovering and sharing these secrets with others and now I want to share them with you. I'll cast the light of my experience on the state of health and the choices you need to make… even BEFORE you decide to start dieting or working out! In my five-part book, I will show you how you can have the healthy lifestyle and the beautiful, trim body you've always wanted. Or any of the other nonsense that's out there. Part One is dedicated to shaping your mindset . Because once your mindset has been shaped, then the rest of your body will naturally follow. I provide good, solid, practical advice to help you make the life-changing, body sculpting, weight loss decisions before you lift any weights or even break a sweat. But that's just the beginning . . .
You have the ability to change your own life by the decisions you make. In Part Two, I will share a series of powerful, practical techniques that can make you live your dreams before you even realize that they're coming true. Remember: anything worth having is worth working for and your beautiful body and healthy, happy life is no different. With my techniques you'll transform your own life as you set goals and make decisions today that will prolong your life and increase your happiness and self image tomorrow. First, I'll provide you with goal-planning tools, and then I'll take you by the hand and show you exactly, step by step, how you can accomplish your goals. These skills will transform your body. And it doesn't stop there . . .
Part Three turns our attention to a well-known but often misunderstood area: food. You may be eating less and wondering why your fad diet isn't working. It's all about balance. In this section, I'm going to show you exactly what you need to do to achieve balance, and it doesn't involve going to bed hungry or waking up tired and grumpy. In fact, if you've tried any of the recent diets out there, there's a good chance that you'll eat even more once you read "Flab to Fab". Hint: The secret is in what you eat, when you eat, and how much of each thing you eat. I'm realistic enough to know that sometimes we have cravings. In Part Three I'm going to give you tips and tricks to help you stick to your healthy eating plan… even when the going gets tough. With "Flab to Fab", there's a good chance you won't ever suffer from cravings again! But that's not all . . . In Part Four you begin to put everything you have learned into action. Our bodies are machines. You don't buy a car just to leave it in the garage: it was meant to be driven. Our bodies are the same, but our lives leave little time or room for activity. We sit at our desks all day and in front of the television all night. I'm going to show you how, with just 15 minutes a day, you can build an effective AND ENJOYABLE fitness program into your life. I'll introduce you to a number of fitness training programs and give you some options so that you can choose the best one for you. You may want to burn more fat. You may want to sculpt your body. You may want to build muscle tone. Whatever it is, I can show you the plan that's appropriate for you, and I'll show you exactly how each and every workout is done. Unlike other fitness ebooks, I'll give you the tools and resources so that you can read the book, interact with the information, and know EXACTLY what to do, how often, how many reps, etc. It's what we call a "no-brainer" because, let's face it, if you have to think about it, then there's a good chance that you won't do it. Healthy lives are all about balance. Food and activity are just two pieces of the puzzle. There's another piece that is all too often left out especially in diet or fitness books. Part Five unveils all the information you need to know about rest. Yes, rest. Rest is such a critical part of our bodies and we often sacrifice proper rest in pursuit of the many other goals in life. Unfortunately, inadequate rest causes stress and stress can sometimes interfere with other aspects of our life (like our ability to eat healthy or exercise properly). So in Part Five I show you why you need rest, how much you need, and how to get a proper rest. Practical Information You Will Use! When I wrote "Flab to Fab" I didn't want to create a quick, carbon copy, cookie cutter "health book" that someone will pick up, read and put down. Many people have already spent far too much money on worthless diet and workout books to have another one cluttering up their lives. Instead, I wrote my book to reveal the most practical information possible in the easiest and most accessible manner possible, and I outlined the step by step actions that are needed to be taken to truly be successful in living a healthy life. You'll find powerful resources on how you can supercharge your metabolism. You'll get a list of resources that I think should be in every healthy person's library. You'll get a great, printable poster to boost your morale when you feel down. You'll get a powerful and popular article I wrote about 8 fitness and health tips to help you lose weight fast. And I'll show you how to "get over the hump" if you find that you've hit a wall in your weight loss. I have dedicated my life to helping other people create the body, mind, and lifestyle that they've always dreamed of having. And now I want to share it all with you. Ultimate "Flab to Fab" Fitness Plan! For a limited time we are giving away Flab To Fab for FREE! Get "Flab to Fab" FREE Now To Receive Your Instant Download and Change Your Life Forever! No Strings Attached! Click Above To Order Your Copy That Is Now FREE! P.S. : Other books are sold for hundreds of dollars and claim to do only half of what I am going to help you to do. With "Flab to Fab" you'll discover life-changing techniques, powerful information, high quality tips, and motivating advice to help you enjoy the healthiest life possible -- all in just fifteen minutes a day. 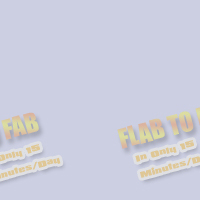 NOTE: Flab To Fab In 15 Minutes/Day is a downloadable e-book. No physical products will be shipped. After you FREE order, you will get INSTANT ACCESS to download the e-book and all the bonus reports onto your computer. The e-book format is adobe acrobat PDF, which can be viewed on Mac or PC.